Mary Beth Meehan is a photographer and educator who creates in-depth portraits of her own communities. Her work addresses issues of immigration, culture, and change, and the emotional charge surrounding them. Hi Mary Beth. Please tell us a bit about your self and what first inspired you to pick up a camera? I grew up in Brockton, Massachusetts, a former shoe-factory town. I have loved photographs ever since my uncle, who was studying photography in New York in the 1970s, started giving me photography books as presents. I stared at the people in those photographs, imagining their lives and their stories. In college I started taking photography courses and began wondering how you could make a life with photography. I was interested in journalism, and found that the University of Missouri had a Master’s program devoted to photojournalism, so I began there. Your series ‘Undocumented’ has been selected as part of THE FENCE 2015. What inspired you to do the project and how long did you spend working on it? The inspiration for the series came in 2010, when I was hearing undocumented immigrants described as criminals we should fear and expel from the country – long before Donald Trump joined the fray. I knew these were people who were already here, woven into our communities. They were our friends and fellow parents, churchgoers, workers. It made me wonder, what is it like to live in fear, every day, all the time – for yourself, your children, your extended family? I have often been drawn to photographing in situations where I felt there was a disconnect between the public perception of a place, or an issue, or a community, and the reality of that community. These people were being savaged by a certain segment of public discourse – without any way of talking back, defending themselves, or even making themselves heard at all. It made me angry. I had recently met and photographed an undocumented man from Guinea-Bissau, West Africa. 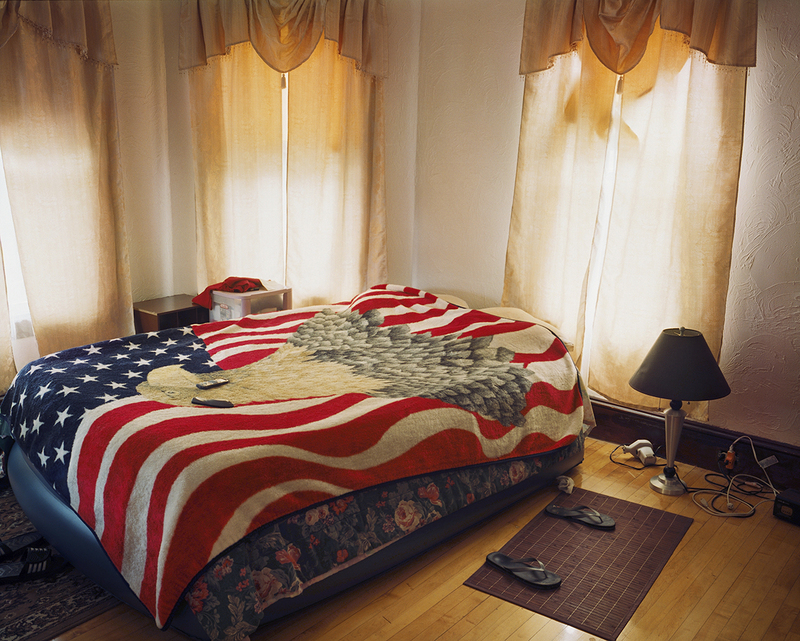 He had few belongings, but on his bed was a fleece blanket in the pattern of the American flag. I thought about the complicated irony of that symbol, and about what it might represent for him. 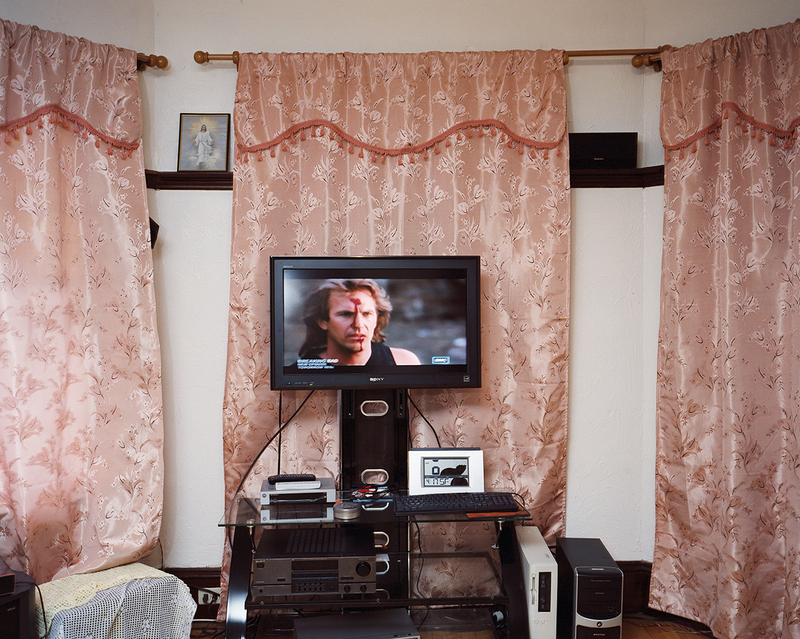 This project came together in my head when I realised that by photographing the rooms where these people were living we might get an idea of who they were — their human-ness and ordinariness, and possibly their motives and intentions — without their identities being revealed. Once I started photographing I worked on this project for about a year. As most undocumented immigrants live their lives hiding, how did you gain access and trust amongst this community to do the project? At my sons’ school – a bilingual charter school where I teach photography – I had a friend named Luz. Luz was on the PTO and was an active member of two different churches. She was from Colombia, and she was undocumented. One day she went to the Department of Motor Vehicles to renew her driver’s licence. She ended up detained for thirty days and then deported back to Medellin. There was a “going away” party held in her family’s honour; many U.S. citizens stood up and said that there were Americans whom they’d rather see thrown out than this family. So I began with Luz. She introduced me to friends in the area, who introduced me to others. I sent letters to the wider school community, and I visited neighbourhood organisations, immigrant-rights groups, and community colleges. I passed around examples of the photographs and carried a notebook for people to write down their name and number if they were willing to work with me. I made it clear that I was photographing rooms only – not identifying people, not using their names or addresses. I only wanted to publish the country they came from and the city where their house was located in the U.S. Sometimes at community events the room would be full and only one or two people would allow me to contact them, but considering the risk they were taking, that felt like a lot. In the beginning especially, I understood that some people didn’t fully understand my role as a photographer, but hoped that working with me might help their immigration status. So I had to be clear that it would not. And I had to make sure people understood that the photographs could appear in exhibit and print form, and online. Despite the lack of humans in the images, the details in the interior bring out the personalities of the inhabitants and you start to imagine what the people living there might be like. With such a sensitive subject matter, what did you find were the biggest photographic challenges when documenting their lives without revealing their identities? I’m glad you feel that you can imagine the people from the photographs. After I was invited into peoples’ homes, the challenge was the same as always: to make a good photograph. Literally, I had to make sure that peoples’ names or addresses weren’t visible anywhere. But after that I had to make sure that the objects, as well as the light and composition and mood, somehow drew a viewer in, and made them care about the people. Sometimes the pictures were boring – curtains on a window and nothing more. And sometimes they went beyond that. Most of us can’t even imagine how it must be living a life in hiding, unable to defend yourself against negative comments and stigmatisation. Can you share with us some of the stories you were told by the people you got to know? The worst stories I heard had to do with the fear, stress, and uncertainty people live with on a daily basis – both because of their status and, in many cases, the traumas that they carry with them from their early lives in their home countries. Many Guatemalans now in New England, for example, survived the civil war in that country in the 1980s, and endured incredible suffering – their villages destroyed, their family members murdered. Then they came here, without access to adequate medical or mental health care, and they are working day and night to support themselves and their families back home. Many haven’t gotten over their original traumas, and now they live continually in a new, different fear. Many people told me of the plans they have in case they get detained, as Luz was. Imagine it: they talk with their children and set out a series of steps for them to take in case they come home from school one day and their parents aren’t there. 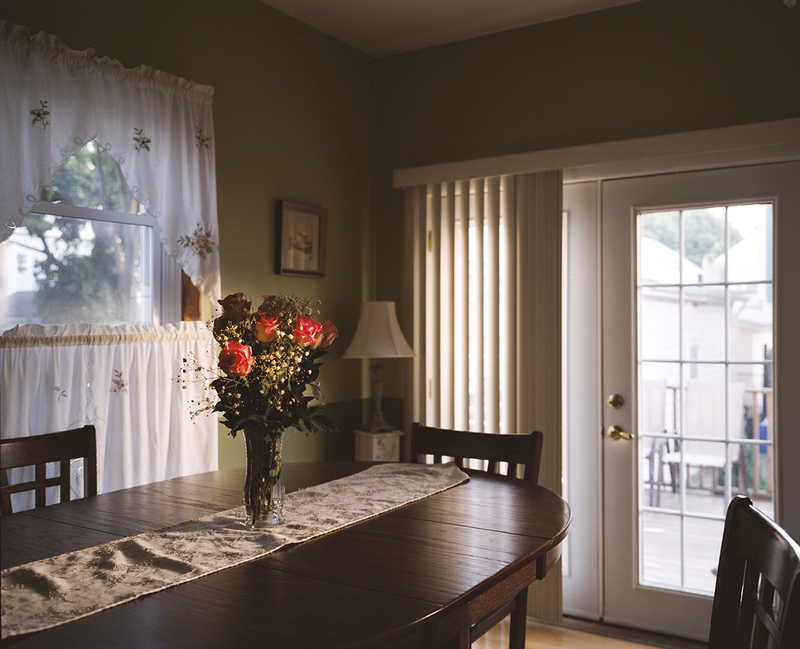 In New Bedford, after the Michael Bianco factory raid in 2007, 362 people were arrested and disappeared into the detention system while their children were at school. Imagine what it was like for those children. Another aspect that really struck me was that many of these people have advanced degrees and had professional careers in their native countries. But because of a lack of work, or a lack of safety at home, they left. And now, because they don’t speak adequate English or their credentials simply aren’t acknowledged in the U.S., they are now working minimum-wage, unskilled jobs here. What did you learn most by doing the project? simply do not exist now, especially for the people we see coming here in the greatest numbers. People who decide to leave Mexico or Guatemala, for example, have a very difficult choice to make: either stay where they are and endure their lives as they are, or put themselves in a situation of having no legal papers in the United States. The people I met are not criminals, and if there was a viable avenue for them to immigrate they would have followed it. This says a great deal more about how powerfully they are motivated to change their lives than it does their criminal tendencies. I wonder what Donald Trump would do if he were faced with these choices. What reactions have you received from people who have seen the images? When I first showed the work in Providence, reactions were mixed. The wife of the gallery manager where I first exhibited tried to convince her husband not to work on the show, because they did not support what I was doing. And yet all I was doing was showing something that already exists: the rooms of people who are already here, whether I photographed them or not. I was asking viewers to set aside their political convictions for one moment to see if they could find some human connection to what they were seeing. But some people became angry. They only wanted to talk about the politics, or the jobs, or the rightness of our borders. On the other hand, many people – including immigrants here legally and also without papers – have said how surprised, and gratified, they felt to see their experiences so publicly pictured. When I went to see THE FENCE installation in Boston for the first time, there was a Spanish-speaking family standing in front of the photographs, talking about the images. When I introduced myself they hugged me, and thanked me for the work. You have also been working on public art installations of photographs; can you tell us a bit more about these projects? Much of my work has to do with the way we look at a place and its people very differently, depending on our experience and our own subjectivity. I became interested in photography in the public sphere through the work of Wendy Ewald and JR, thinking about how imagery can disrupt our experiences and assumptions about our own communities. In 2011, twelve images from my series “City of Champions,” which looks at the evolving cultural makeup of my hometown of Brockton, were installed in that city’s downtown. The work launched many discussions about how American cities have changed, and the emotional complexity of those changes. More recently, eight photographs from “Seen/Unseen,” a series of Providence portraits, were reproduced as forty-foot banners and installed on buildings in downtown Providence. The installation has raised big questions – about how segregated the city is, about who is “seen” and who is “unseen” – and by whom – and about who has access to the institutions that confer public visibility in cities like Providence nationwide. People have told me that the “Seen/Unseen” project has brought disparate groups within the city together and created a bridge between them. One person said that the work was a “balm” of connection and understanding for the city, especially after the horrible events unfolding in Ferguson, Baltimore, and across the country. These are deeply gratifying reactions. What is your favourite subject matter, and what can we expect to see from you in the future? I love photographing people (or, in the case of “Undocumented,” photographing people without them being pictured). I love meeting someone who interests me, getting past our initial discomfort, and then trying to understand something real about them. It’s then a challenge to make a photograph that feels, somehow, like an authentic connection, that taps into the emotional charge of the encounter between us. I also love applying my work to a problem that I see, which is people not seeing each other clearly. In Brockton, where people lived with the photographic installation for a year, people talked about how, in the busyness of their daily lives, they were apt to pass right by people, engrossed in their own thoughts, and not ever engage the person or even wonder about them. But when the photograph was there – in their faces, and over time – they began to wonder about the person, to think about what he or she was experiencing, what they might have in common. And in some small way, it was transformative for them. There has been so much public reaction to the “Seen/Unseen” installation in Providence that I am working now to understand and document that, both in video and in written form. Through interviews with people on the street, as well as the people whose photographs were featured, I want more insight into the power and potential of photography. In the past year we have all seen the damage done by our inability to empathise across racial, cultural, and class differences. I’m interested in learning more about the possibilities for using art and image-making to address those blocks and expand our views of one another. In terms of new work, I just got back from Haiti. I travelled there with a group of people I’ve known for years, who came from Haiti to Providence in the 1980s. They were born in a mountain village without electricity and running water, came here and worked as school bus drivers and nurse’s assistants, and now have Ivy-league-educated American-born children. I’m amazed by their journeys. I’m not sure what this project is yet or the direction it will take, but I’m following it. I’d like to express my gratitude for being a part of THE FENCE installation. To see my “Undocumented” pictures within view of the Statue of Liberty was an especially moving experience. And thank you for this opportunity to speak with you.